Let me back up and tell the story. My Friend prayed the Sinner’s Prayer, but . .
My friend was an international exchange student over 25 years ago. He left his home, his country, and his culture to experience a school year in the United States. Exchange programs like the one he participated in can have long life benefits and friendships. For example, my family remains in contact with the exchange student we hosted when I was in 3rd grade. Others don’t work out so well. My friend was hosted by a Christian family who probably wanted to change the world for Christ. Many followers of Christ open their homes to foreign exchange students with an idea of sharing Christ with students and praying for their salvation. It can be an awesome relational evangelism strategy. When our family hosted students, none of us were followers of Christ so we didn’t even think about these things. The host family started taking him to church with them on a regular basis. Being a polite guest, my friend attended services, though he doesn’t remember much about them. After a few weeks of being in the house of his host family, my friend was invited to pray with the head of the household. Being a polite guest who didn’t want to offend his host, my friend complied with the wishes of the evangelizing gentleman. The man would pray a phrase, my friend obligingly complied and repeated after him. When the Amen was pronounced, the host congratulated my friend for praying the prayer with him. I didn’t want to offend him. I didn’t want to pray. I don’t know how to pray. But he was my host and I didn’t want to embarrass him by saying no. I don’t remember what the prayer was about. I simply repeated what he said. All I remember it was awkward, uncomfortable and I couldn’t wait until it was over. The next Sunday, my host got up and told the church that I had prayed with him. They all applauded. Afterwards, people were coming up to me to say stuff like congratulations, welcome to the family. They’d shake my hand, give me a hug, or pat me on the back. That was weird. Chris, what was that all about? My friend “prayed the prayer” but remains a spiritually adrift agnostic. 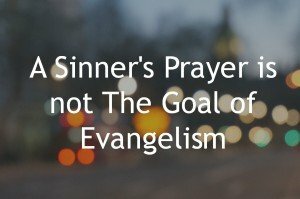 The goal of personal evangelism is not a sinner’s prayer. The goal of personal evangelism is not a prayer to receive Christ. Saying a sinner’s prayer is not “a get of hell free” card. I’ve seen too much abuse of this practice, where it is reduced to a superstitious formula that gives false hope. I’ve watched preachers give altar calls after sermons where the gospel is not even given, inviting people to raise their hand, pray this prayer, and then come forward for a free gift. One preacher even offered a Hillsongs CD to someone who raised their hand to receive Christ. My jaw dropped. as in the case of my friend, being polite. The head of the household where my friend stayed appears to have reduced the sinner’s prayer to a spiritual transaction, apart from the gospel, apart from any understanding of sin, apart from any comprehension of the amazing grace of God. You could be out doing contact evangelism with random strangers. You could be taking the gospel door to door, or taking the slower road via relational evangelism like the disciples may have. I remember doing contact street evangelism in Austria in the early 90s. We did a short drama, a short preaching to the crowd that gathered, and then quickly invite people to raise their hands to follow Christ. To be the street preacher, I had learned to share a simple gospel script for the post drama conversations, such as the Ten Commandments, or the Bridge Illustration. I had less than 5 minutes to connect the drama to the gospel. Some of those 5 minutes were taken up by the translator who repeat every word I said its German equivalent. As the young evangelist, I was thrilled – she wanted to receive Christ. I led her in a prayer of surrender and then proclaimed to people that she prayed to receive Christ. Reflecting on this story nearly 20 years later, I doubt there was a genuine conversion. She wanted to join our movement, to find a cause. She didn’t know the gospel and I doubt I got the full gospel shared in my 5 minute preaching. I don’t remember any sense of the conviction of sin, nor any sense of repentance, just a desire to be part of us. I had reduced the sinner’s prayer to a superstitious charm. The goal of personal evangelism as I define it is discipleship. active service in the Kingdom of God. Fruitful evangelism produces a growing disciple. Fruitful evangelism happens when the Holy Spirit is at work revealing sin, revealing the love of God, and helping a person respond. You see that in the story of Zaccheus. Fruitful evangelism is obvious when there is an “I get it” moment, aswhen a person is overwhelmed by the grace of God. There is a genuine conversion and discipleship starts. That evidence includes a desire to connect with a local church, a desire to start read the Scriptures, and a growing awareness of personal sin and God’s holiness. We once did contact evangelism in a local park. Praying a sinner’s prayer of surrender might be the gateway to discipleship. It was for this woman. It was the end point of the process of evangelism. Helping a person praying such a prayer can be a way to help a person respond to the grace of Christ. A sinners prayer can mark the beginning, but is not the guarantee of a disciple. The goal of evangelism is not a sinner’s prayer, but a growing disciple. Related: Evangelism without discipleship is incomplete. I got a lot of encouragement from this article Chris. Thank you. i will have to read it several times and do some reflection on the way I share Christ. I’m going to forward it to some friends too. Thanks for the encouragement. . . I want to be a faithful evangelist, but I don’t want to fall into the trap of simply getting decisions. I want people to know the grace of Christ, rather than any slick argument I might learn from a book or any techinque that could manipulate a response. This is such an important issue in the church today! So many churches seem to stress the superficial, the simplistic, in an effort to swell their numbers. In doing so they often leave out repentance, personal faith, and following Christ in life as well as theory. Christ calls us to make disciples, not sign commitment cards. I just want to thank you for this important article! !